As LiFE is a core benefit of EAUC Membership, you can really see how Membership can help you and your institution progress. 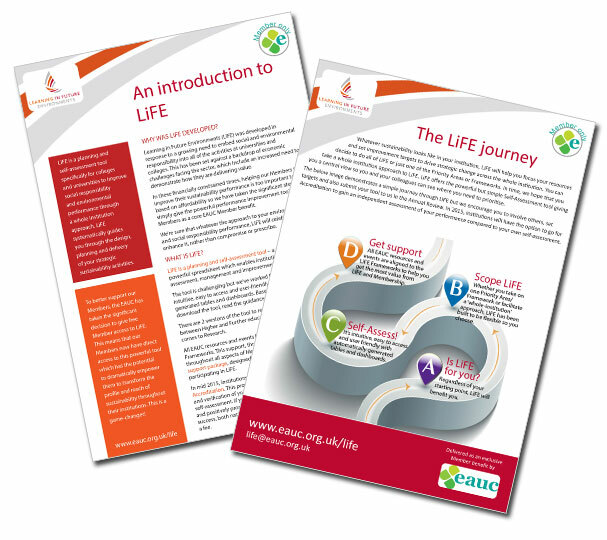 All of our resources and events have been aligned to the LiFE Frameworks so you can clearly link where you need support to progress in LiFE - helping you to focus your activity. A page giving you links to all of the definitions and resources for each Framework. Each EAUC event or webinar is allocated to a Framework to help you identify how and where your attendance will help your progression within LiFE. All resources are aligned to the Frameworks in LiFE. You can use the filters to narrow down your search to find the specific resource you need. Engaging others with LiFE is a key part of the journey and you can do this in many ways. LiFE brings us an opportunity to demonstrate how Membership can help you and your institution progress. We will ensure that all Members have a range of materials and support that have clear linkages to LiFE to help you meet the targets you’ve set for yourself. The most valuable resource is the support the EAUC can give you directly. Whether it's understanding LiFE, finding resources, advice on engaging others or completing a self-assessment, contact us by phone or email.